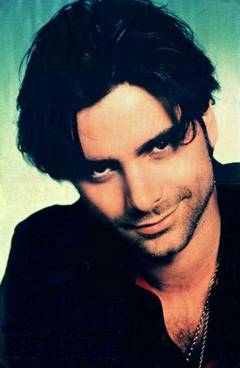 John Philip Stamos was born on August 19, 1963 in Cypress, California. He is the oldest child of three, having two younger sisters, Jannen and Alaina, who are both teachers. His parents are Bill Stamos, a restaurateur, and Loretta Philips, a former swimsuit model who is of Irish and English heritage. John's grandparents moved to the USA from Greece. After their immigration they shortened their last name from Stamatopoulos to Stamos. In 1994, John met model Rebecca Romijn at a fashion show of Victoria's Secret. Two months later they started dating and on September 19, 1998 they got married. In April 2004 however, they separated and on March 1, 2005, the couple divorced. After his marriage, John kept silence over his love life, but in August 2012, he told PEOPLE that he'sa happy bachelor at the moment. In 1976, John attended his first Beach Boys concert and at the age of 15, he began to pursue acting and music in earnest. He was supported by his parents to pursue his artistic aspirations. Although he intended to enroll at Cypress College in 1981, John's father agreed that John should skip his first semester, so he could take a legitimate shot at a professional acting career. John attended the John F. Kennedy High School, where he played drums in de school's marching band. He also went to Wentworth Institute of Technology. One of John's first jobs was for his family's fast-food eateries, the Orange County-based Duke's and Yellow Basket restaurants, where he was flipping burgers in his teen years. John started his professional acting career on the soap "General Hospital". From 1982 to 1984 he played Blackie Parrish. His character was originally scheduled for a five-episode arc, but because of his high popularity, he was made a regular on the show. For his role he won two Soap Opera Digest Awards, in both 1982 and 1983. In 1984 John Stamos appeared in the 12-episodes long sitcom 'Dreams", playing the frontman of a working-class band from Philadelphia. His best-known role to date however, is playing Jesse Katsopolis on Full House. Originally his character was called Jesse Cochran, but John wanted to honor his Greek heritage, so on his request the last name of his character was changed to Katsopolis. During the run of Full House, John Stamos took on several side projects, like the movies "Born to Ride" in 1991, "The disappearance of Christina" in 1993 and in 1994 the TV-movie "Fatal Vows: The Alexandra O'Hara Story." In 1995 John showed his dancing ability in the Broadway production of "How to Succeed in Business Without Really Trying", playing the role of J. Pierrepont Finch. After Full House, John took on several acting jobs. In 2001 he had a starring role in the TV show "Thieves" and in 2005 he played a leading role in "Jake in Progress". In 2003, John Stamos was a guest star on Friends. A remarkable fact is that this show used the same set as Full House. From 2006 to 2009, John starred as Dr. Tony gates on the medical drama ER. In September 2009, he started playing the role of Albert in the Broadway revival of Bye Bye Birdie. In September 2010 John Stamos starred in a multi-episode arc on the second season of Glee, playing Dr. Carl Howell. Like many of his former Full House co-stars, John gave his voice to one of the penguins in Bob Saget's mockery "Farce of the Penguins" (2006). In 2008 John was the roastmaster on Comedy Central's Roast of Bob Saget. In 2011, John guest-starred on "Law & Order: Special Victims Unit" and he featured in a CollegeHumor video with Bob Saget. he also guest-starred as himself on Two And A Half Men. John also stars in the music video for the song "Go to Sleep" by Low. Besides his movie and TV work, John appears in a series of commercials for Danone's Greek yogurt brand Oikos since 2011. In February 2012, it was announced that John would take on one of the lead roles on the new Fox drama "Little Brother". In 2012 he also played ruthless presidential candidate Joseph Cantwell on the Broadway Show "The Best Man". In 2013, John got new roles on 2 series, besides his (recurring) role on The new Normal. Besides acting, John is a musician. Since 1985 he occasionally drums with the Beach Boys. This started when he was invited to the Beach Boys to drum with them at their Fourth of July set in 1985. Because the band was pleased with Stamos' performance, they used him more often as a touring and session drummer. After he appeared in the video for the 1988 hit "Kokomo," John sang the vocals of the Beach Boys song "Forever" in 1992. This song later appeared in Full House. There were also a couple of appearances by members of this band on Full House. John also directed the video for the Beach Boys' song "Hot Fun in Summertime". In 1994 John independently released an album entitled "Shades of Blue", with Lanny Cordola, Gary Griffin, Sandra Stephens, Tony Guerrero and David Enos. On the 2006 charity album "Unexpected Dreams - Sounds From The Stars" John performed the Billy Joel song "Lullaby (Goodnight, My Angel)". In September 2015, John stars in the FOX comedy 'Grandfathered' in which he plays a successful restaurant owner and lifelong bachelor who finds out he's a dad and a grandfather. John will produce and guest star on the Full House sequel 'Fuller House' which will debut on Netflix in 2016. During his career, John won a couple of awards. In 1982 he won a Soapy Award for most exciting new actor and in 1984 the Your Artis Award for best young actor in a daytime series. Both awards were for his role in General Hospital. In 2007 John won the TV Land Award for favorite Elvis impersonation. He earned this award for a performace on Full House. In 1990, John Stamos was chosen as one of the 50 most beautiful people in the world by People Magazine. John has a lifetime pass to Disneyland. In 2000, he bought an entrance sign of Disneyland on eBay for the sum of $ 30,700. Like his character Jesse Katsopolis, John Stamos loves Elvis Presley. John also has his own production company, called "St. Amos Productions". In June 2015, John went into a month-long rehab for substance abuse, after having a rough year in which his mother died. Celebrate #StamosDay on August 19th and make a birthday card for homeless kids!